Many people may not be familiar with the benefits of getting infants adjusted, and yet many infants show signs of misalignment at an early age. Lets face it, being born is tough work! Over 80% of newborn babies have strained spinal columns just from the birthing process alone, which can cause irritability, collics, difficulty latching during breast feeding and frequent ear infections. Even if a baby doesn’t have any of those symptoms, being curled up in the fetal position their entire life and feeling the pressures of birth can be enough to misalign their fragile little bodies. A lot of parents are probably wondering how safe it is to have an infant adjusted. 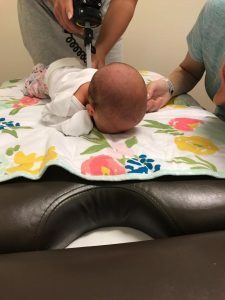 Many of us think about the pressure we sometimes feel during an adjustment, but skilled Chiropractors are aware of how much of an impact a newborn baby will benefit from, which is about the same amount of pressure we use when checking a ripe tomato. Since their bodies are still forming, their bones glide easily back into place with a small amount of pressure. Having your child adjusted and aligned gets their nervous system flowing more smoothly, allowing for increased immunity, regular sleep patterns, and overall improved development for balance, posture and shock absorption.